In the oppressive heat of the arid Granada hills, Dan and Sarah Tanner’s dream of a new life in Spain is shattered when their son dies after an altercation in the village. A local boy, Alejandro Moreno, is charged with murder but when he is acquitted Dan can barely control his rage. Events begin to spiral out of control when Alejandro turns up dead, the victim of a hit and run. Dan has no alibi and the circumstantial evidence looks bad. Alejandro’s father swears revenge on Dan. Things become no clearer when young British ex-pat Liam arrives unannounced. Dan and Liam met once before, in a bar after the trial. Liam claims they made an agreement, a pact, and has come to claim his part of the deal. Dan has no idea what he is talking about. Liam admits that he killed Alejandro and now it is time for Dan to fulfil his part of the deal - to kill someone for Liam. He tells a story of the horrific abuse he suffered at the hands of Ralph Chalmers a former care-home worker now retired to a nearby village. Liam demands the justice so far denied him. Struggling to cope with the loss of their son and the ongoing police investigation, Dan and Sarah’s marriage begins to crack under the strain. Sarah wants to go home and leave the bad memories behind but Dan is determined to hang on to their dream. When Dan refuses to do Liam’s bidding, Liam turns to plan B. Blackmail. Liam threatens to incriminate Dan in Alejandro’s death if Chalmers is not killed. Stuck in an impossible situation, Dan faces the loss of everything, his marriage, his new life and his liberty - and the only way out appears to be murder. The desire for revenge is as old as the world itself, one of the most basic human impulses. And no matter how civilised or educated or tolerant we become, given the right circumstances, this primitive desire is never far away. 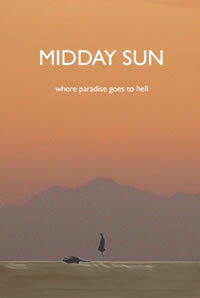 What excites me about Midday Sun is the way it explores how I - a son, my girlfriend’s partner, a father - live perilously close to that place where committing the most barbaric of acts seems the only ‘reasonable’ option left. And how opening that door leaves me vulnerable to being exploited by others. The tight psychological focus of the narrative - Dan Tanner’s desire to revenge the death of his son, the tightening police investigation into the killing of the Spanish boy, Dan’s estrangement from his wife and the careful manipulations by Liam - provides a great motor to inspire terrific performances from actors out to prove their worth, and a wonderful hook to draw in audiences who demand an emotionally complex cinematic experience. As solo writer, Steve Lewis currently has a big budget feature in development with Harry Potter exec-producer David Barron’s Contagious Films and was also a contributing writer on Trouble TV’s award-winning animation Flashband. Tony Owen’s adaptation of a Jill Paton Walsh novel is in development with Double Scorpio Pictures. His short film Fish was short-listed for the Levi prize and he also worked on on Three Blind Mice (2003) for Haystack films. Working together for the past five years, they currently have a New York based drama in development with Tony Garnett’s World Productions with award-winning Romanian director Robert Pejo (Dallas Pashamende) attached. A British based comedy-drama is in development with Simon Films (USA) to be produced by a team including Martin Huberty (Fried Green Tomatoes) and Laura Burrows (Rabbit-Proof Fence) with Jon Avnet (Up Close and Personal) as Exec-Producer. A third project is in development with London-based Whatever Pictures, a comedy-drama to be directed by Bruce Webb.